From 1986 to 1994 the Caribbean nation of Haiti experienced a series of dramatic events: the overthrow of ‘Baby Doc’ Duvalier, the violent disruption of voting, the overwhelming electoral victory of Jean-Bertrand Aristide, a coup d etat and a US-led military operation to return Aristide to power. Even by Haiti’s standards, these were exceptional episodes in a long history of political instability and social unrest. The world s media chronicled Haiti’s turbulent trajectory through newspaper articles and news films. But perhaps more importantly, Haitians themselves reacted to the cycle of hope and despair that made up their daily lives in the form of hundreds of spontaneous street murals. Mostly in the capital, Port-au-Prince, these colourful and expressive paintings both recorded key events and articulated the hopes and fears of their creators. Some targeted the fallen Duvalier and his henchmen, others the military regimes that succeeded the dictatorship. Many were later produced to celebrate the triumph of Aristide and his lavalas movement, while in 1994 a ‘third wave’ arrived in the wake of the UN-sanctioned invasion by US forces. Haiti s popular murals mix a vital sense of the contemporary with more timeless themes and motifs. Drawing on a distinguished tradition of naïve art and produced by artists from many different backgrounds, they are rich in allusions to Haiti s revolutionary history, record of anti-colonial struggle and belief in Vodou. Inspirational leaders such as Toussaint Louverture and Dessalines appear in these images, as do the Vodou deities Ogou, the iron warrior, and Ezili, the goddess of love. Alongside Christian messages of martyrdom and redemption, the paintings invoke the Vodou rituals of sacrifice and spirit possession. 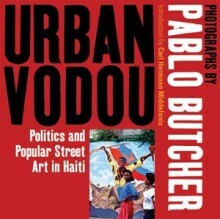 Captured in 120 full colour photographs by Pablo Butcher, these murals many of which have now disappeared tell in vivid terms how Haitians viewed their unfolding political drama, and literally imposed this view on their urban surroundings. Pablo Butcher is a photographer living in France and a frequent visitor to Haiti. Carl Hermann Middelanis is a German academic with a special interest in Haitian history and literature.